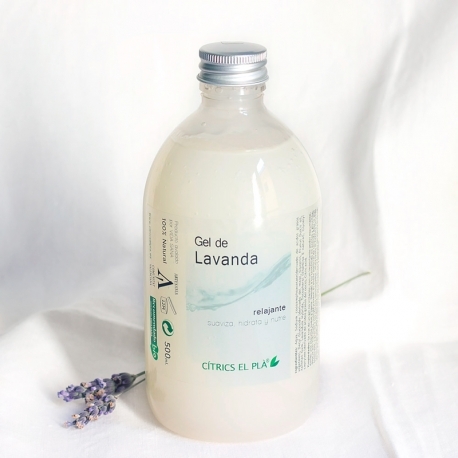 The Natural Lavender Gel is a non-irritating bath and shower gel with soft foam. The high content of vegetable oils and glycerin leaves the skin nourished, toned and smooth. It hasn’t been tested on animals. The Natural Lavender Gel is a non-irritating shower gel with soft foam. The high content of vegetable oils and glycerin leaves the skin nourished, toned and smooth. One of its main effects is the relaxation of the nervous and muscular system, so it is highly recommended after exercise, after a day of stress or simply to relax and unwind. Water, Sodium cocoamphoacetate (derived from acid vegetable fats), Decyl Glucoside (derived from corn), Glycerin, Sweet Almond Oil, Xanthan Gum, Lavandula Hybrid, Tocopherol (Natural Vitamin E), Glyceryl caprylate (derived from coconut acids), citric acid.